My main character in Paris Red is poor. When Victorine Meurent meets Manet, she’s working as a brunisseuse, or a silver burnisher, and she has very little money to live on. She eats as cheaply as she can, buying her meals on the streets, and many days she gets by on bread and soup—soupe aux choux, or cabbage soup, and sometimes potato. From these images, I was able to write this portion of a scene, which takes place on a day when Victorine isn’t sure when she will get paid again. I see the people around the marchande before I see her there on the trottoir, underneath an awning. She sits with four kettles around her and dishes up from the kettle right in front of her, the only one with the lid off. For ten sous you get a small piece of bread and a ladle of soup. Still soupe du matin but so late that I get the bottom of pot where the creamy broth has thickened with chunks of cabbage and leeks. At first I smelled the soup, so blindingly cabbage that it perfumed the air for a block, but now that I am standing here, eating, I cannot smell it. Can only feel the fullness in my mouth and the warmth going down. Three workers in their aprons and caps stand there with me, slurping. When I’m done, I hand my bowl to the old man sitting beside the marchande, who has been steadily washing bowls and spoons in a wooden bucket. I finish before any of the workmen. The first meal of the day, and maybe the last. I should have taken my time eating it. Should have been more like the workmen, who did not eat as quickly as I did for fear of leaving most of their soup on their mustaches. I love soup. For me, it’s the perfect meal. One of my favorite soups to make is lentil minestrone, which has lots of spinach in it, and a chicken base. Sometimes I eat it for breakfast. It’s just another way to feel close to Victorine. I love the picture of les Halles. I went to the wonderful Doisneau exhibition at the Hôtel de Ville last year – two hundred photographs taken over forty years in the quartier les Halles. And Émile Zola’s detailed and graphic descriptions the quartier in ‘Le Ventre de Paris’ are unsurpassed. A casual visitor to les Halles today would find it almost impossible to imagine the former ‘Belly of Paris’ without reference to Doisneau, Zola and of course to you and Victorine’s story. I suppose some of us look back on the vast food market at les Halles with perhaps misguided nostalgia, especially after the simply ghastly redevelopment that replaced it (now being redeveloped again). 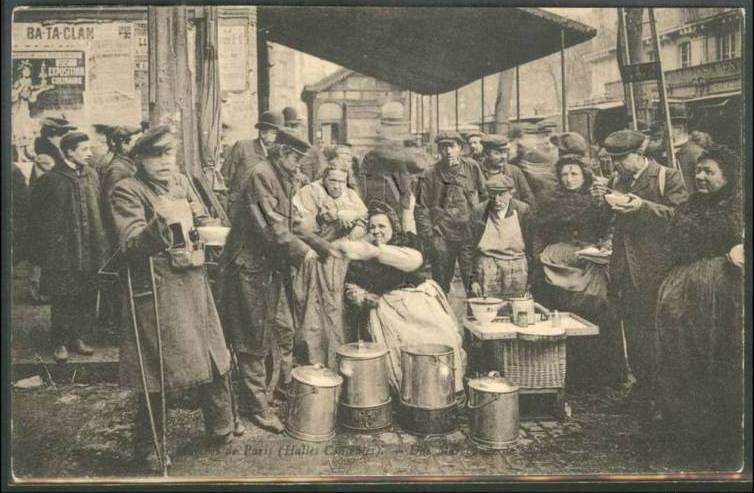 But of course, if we stop to think about it, the original market too was a ghastly place – full of colourful and engaging characters maybe – but also full of poverty and deprivation. I do think though that it’s a great shame that not one single vestige of the original market remains in today’s les Halles. One of the original iron pavilions was moved to a site on the banks of the Marne out in the Paris suburbs but in the quartier les Halles there is absolutely nothing left. When the current redevelopment of les Halles is completed we will have an ultra-modern, completely soulless shopping centre devoid of any character at all – about as far removed from le Ventre de Paris as it’s possible to get. Would Victorine feel at home here I wonder? Thank you for your beautiful comment on my blog. When I read about the original market at Les Halles, I always wish I could have seen it as it was! Yet I also have this memory: in 1983, when I was 20 years old and studying in Paris, I would often walk with my boyfriend around Les Halles and the Pompidou. We loved to watch the sword swallowers and hear the musicians. We were like all the other young people we saw, and that’s where I fell in love. So when I think of Les Halles, I also think of my boyfriend’s beautiful face, and myself when I was 20, in a pretty black dress that had straps at the shoulders. It was never a soulless place to me — at 20, I had plenty of soul to spare, if that makes sense. And an even more beautiful reply if I may say so.